This guide will show you how to add manually the Littledata script to your shop. Note: The custom manual install route is recommended if your store has a custom layout. We do recommend this is done by someone in your team who is familiar with code/scripts. As part of the install you will need to add the tracking code manually to your Shopify store layout. Below are the detailed instructions. Step 1. Select the custom route. Step 2. Select add the code manually and click next. Step 3.1. 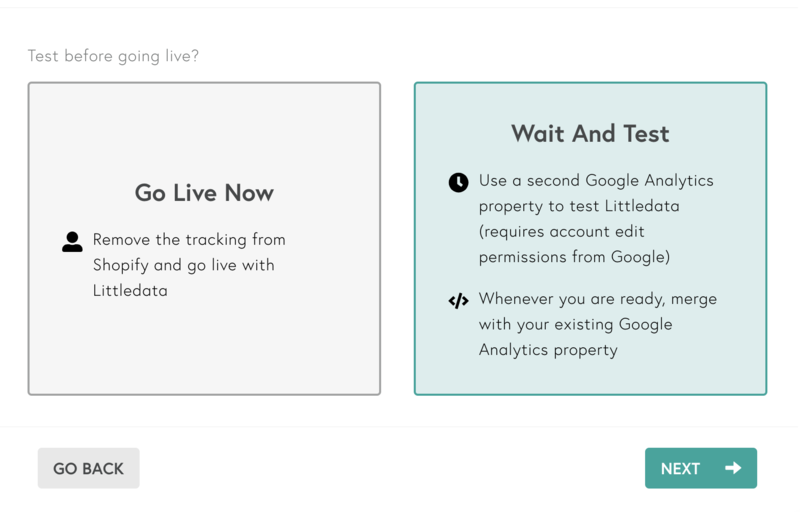 Select Go Live if you want to use the Littledata tracker on your original Google Analytics property. If you wish to test the tracking for a few days, ignore this step and proceed with step 3.2. Step 3.2. Select Wait and Test to test the tracking for 72 hours (you will receive an email reminding you that time's up and you can make the switch). This is recommended for larger stores, and stores that want to test out Littledata. 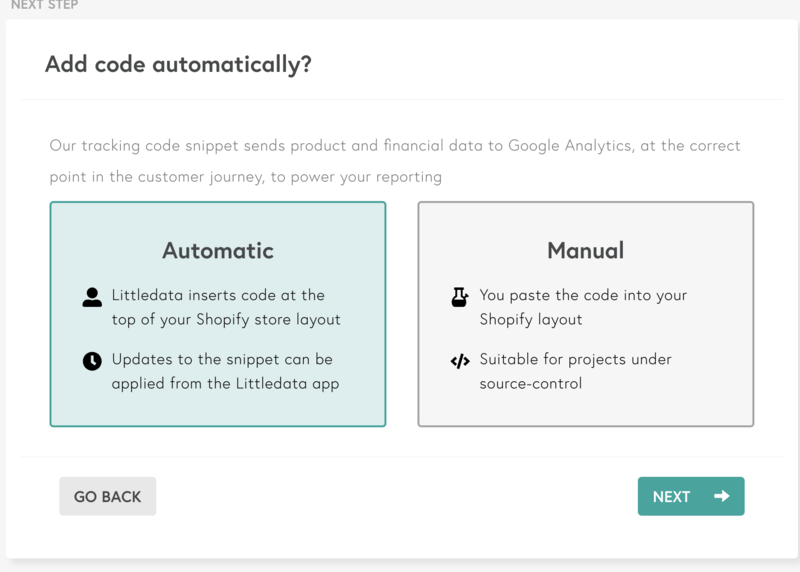 What will happen is that we will create a separate test property in your Google Analytics and that is where data will be sent by the Littledata tracker. Using this route means data is not sent to your original UA but to the test property. Step 4. Next is the step where you will be instructed to add the scripts to your code. This is where you will press the COPY text, which will copy the script to clipboard. Step 5. 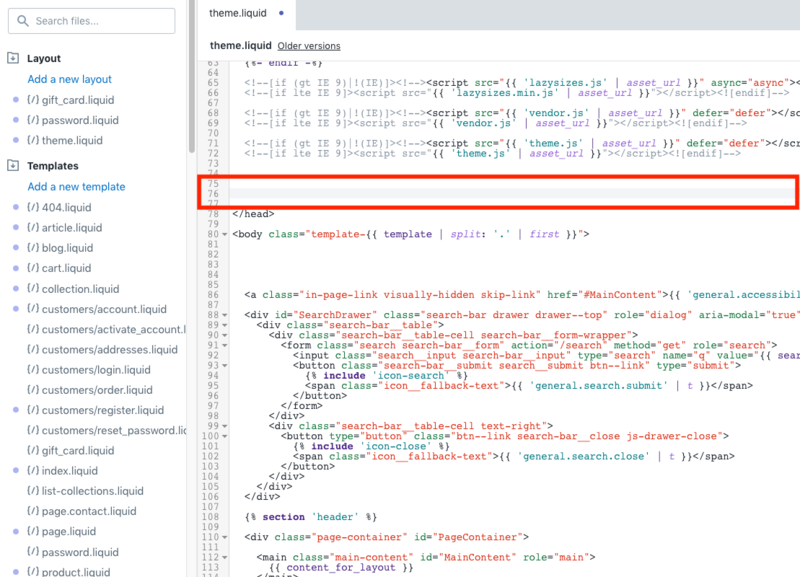 You will then go to your Shopify admin > Online Store > Themes > Actions > Edit code and create a new snippet named LittledataLayer; you will then paste the script in and click on save. Step 5. Then you will copy the 3 line code and paste the snippet in every one of your store’s layouts, just above the </head> tag. In the example below, we’ll paste the snippet in row 75. Step 6. In 72 hours, you will get an email from us saying that you can now merge your data. Step 7. 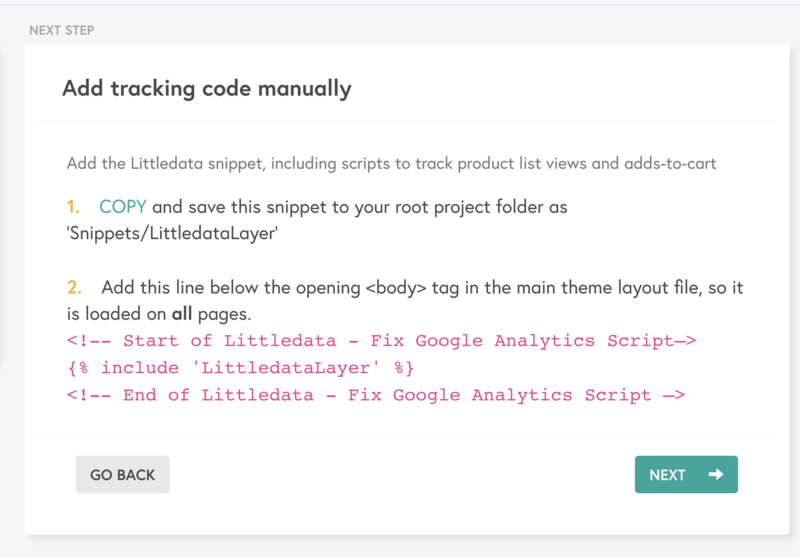 Now that you've tested out the data you can start using the Littledata tracker to send data to your original Google Analytics property. 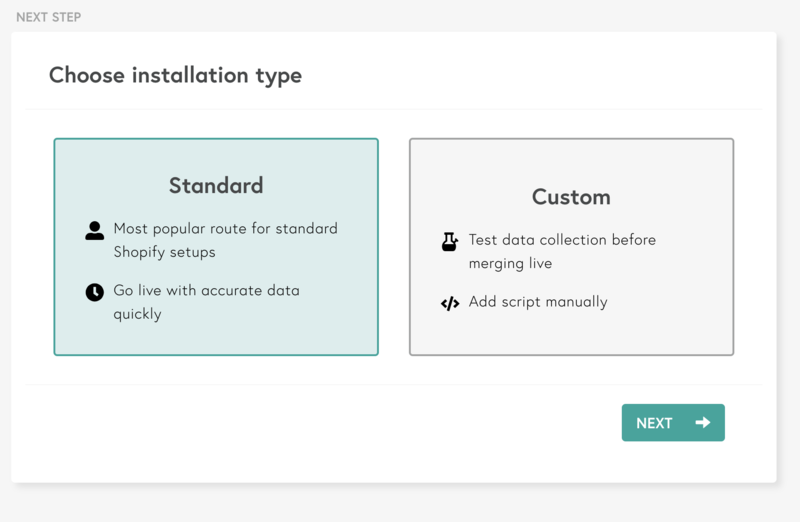 You will have to manually change the test property with your original one in the LittledataLayer snippet when you go live. You will be provided with instructions on how to do this. Step 8. 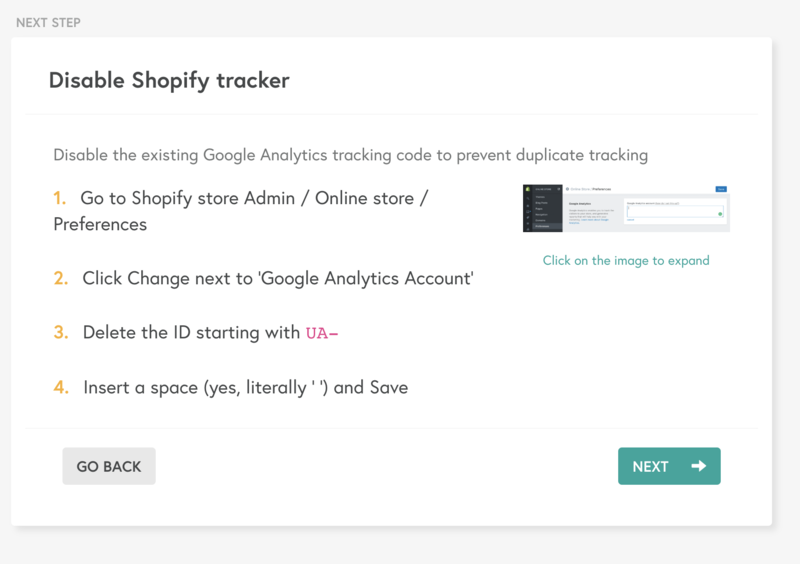 After adding the code, you will be prompted to disable the current Shopify tracker in order to prevent duplicate tracking. Note: You will need to add the three line code to your layouts when you are installing our app, but also when you create another layout for a new campaign. Anytime you create a new layout, just follow these steps to add the code snippet.